Sonos has introduced a wireless subwoofer that’s designed to work alongside the company’s existing stereo speaker offerings. The product aims to rectify concerns that some users have had with regards to Sonos satellite speakers lacking in the bass department. 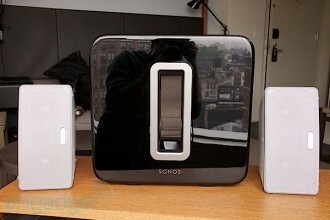 The Sonos Sub was unveiled during New York’s Design Week and shown to select media outlets at the Cooper Square Hotel. The Sonos Sub resembles a black square donut with a hole in the center. This forward-thinking design is said to accomplish two goals. First, its design is aesthetically pleasing and won’t be an eye sore sitting out in the open in a living room. Sonos reps told The Verge that most people don’t like their subwoofer because it’s big and ugly. Additionally, the hole in the center of the Sub allows the two speakers to face each other, effectively cancelling out almost all vibrations without affecting sound quality or output. All of the sound from the Sub comes out of this central chamber. The wireless component means that you simply need to plug the device into an outlet for power and pair it with a Sonos system. The Sub is compatible with all Sonos amplified components. Those with Sonos non-amplified systems and non-Sonos systems need not apply. Despite it being a portable system, it weighs over 36 pounds so you probably won’t want to move it too often. Sonos plans to ship the glossy black Sub on June 15 for $699 with a matte black finish available in October for $599.